From motivational speaking for a crowd of thousands to rolling up your sleeves and doing a deep dive workshop to helping you plan your event, Candy is your go to speaker. 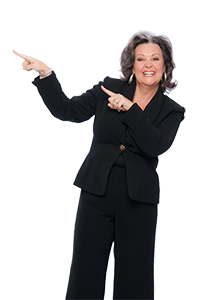 She brings tons of interaction, energy and motivation to each of her speaking engagements. Quite frankly, she can do it all! … She’s been known to move tables….wait on tables…clear food from tables….and dance on tables…NO tip necessary! Candy works directly with her clients to customize the presentation to meet their specific needs...she is also very dynamic and interactive and will adjust as needed based upon participant interaction and feedback during the session to ensure all areas receive the right amount of attention...Remember Candy Can...but her presentations aren't canned. Note: If you are looking for accredited sessions for Continuing Education Credits, Candy's Topics are Acreddited with SHRM and she will be glad to work with you on obtaining accreditation for your organizational needs as well, just give her a call to discuss. Do we have folks with special needs or considerations? Candy is very interactive and wants to make sure everyone is comfortable and feels like they are a part of the event.